But there is another Detroit family jewel in question that is largely unknown outside the automobile world and to some people even more treasured — a collection of 62 lovingly maintained classic cars donated to the city since the 1950s by civic-minded families seeking to preserve the Motor in Motor City. 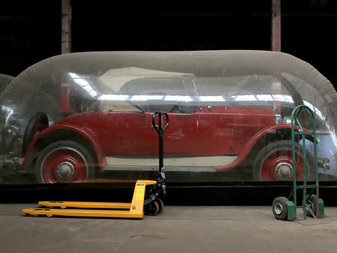 Most of the cars are stored under protective plastic bubbles in a World War II-era riverfront warehouse on the grounds of Fort Wayne, while others are on display at the Detroit Historical Museum or on loan to exhibits around the country. If they're not on display now, and they're not even being actively monitored for preservative maintenance...it would be much better to sell them to a museum or collector that would display them. Such things shouldn't just be squirreled away. From the point of view of the public good, the only difference between having historical cars in a closed warehouse and not having them at all is the taxes that Detroiters pay for the warehouse staff, insurance and other related expenses. Just makes me sad. I often wonder where all the Sloan Museum cars are being stored.